MANILA, Philippines- A tearjerking farewell video for Caitlin Soleil Lucas, more popularly known to netizens as “Courageous Caitie, has been shared by Nice Print Photography just days after Filipinos bid their final goodbye to the little warrior. On Sunday, April 3, a one-of-a-kind memorial service dubbed as the “wedding of the year” was held for the courageous little trooper who battled juvenile myelomonocytic leukemia (JML). 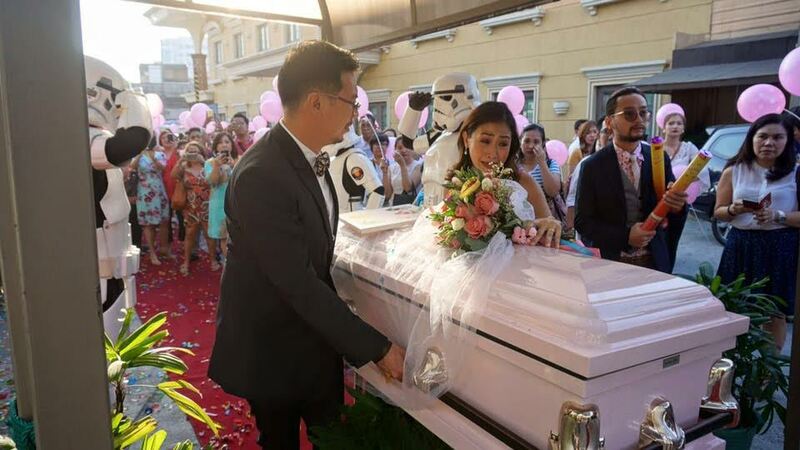 Caitie’s wedding-inspired service complete with stormtroopers, confetti, pink balloons and colorful decorations was her parents Jayjay and Feliz’s way of turning over their daughter to Jesus in marriage. The memorial service led by Christ’s Commission Fellowship Pastor Roy Felipe started at 3pm, while the cremation process happened at 4:00pm at the Arlington Memorial Hall in Quezon City. The “wedding reception” was held at 7:30 pm. The little warrior’s ordeal with the rare form of leukemia started after her parents noticed rashes which turned into bruises in December last year. Initially, Caitie was misdiagnosed with tuberculosis last January and underwent a series of medication for it. Unfortunately, her conditioned only worsened. On February, her family brought her to a reputable hospital in Singapore where she was diagnosed with JML. After a three-month battle, Courageous Caitie succumbed to her disease on Thursday, March 31. Her happy disposition and unbelievable display of courage despite her difficult and painful situation has attracted thousands of followers and donors on her Facebook page. With over 300,000 likes as of this writing, Caitie’s short but well-lived life has truly inspired thousands of netizens. Watch the equally heartwarming and heartwrenching farewell video of Courageous Caitie.